These Cable Sign Supplies Accommodate (2) 8-1/2" x 11" Posters Simultaneously! S-Hooks are Enclosed for Using the Units with Additional Panels! Our Online Store Sells these Cable Sign Supplies, as well as Vinyl Banners with Screen Printing at Wholesale! Cable sign holders come with (2) s-hooks for connecting to other frames. Acrylic is precision laser cut for quality. 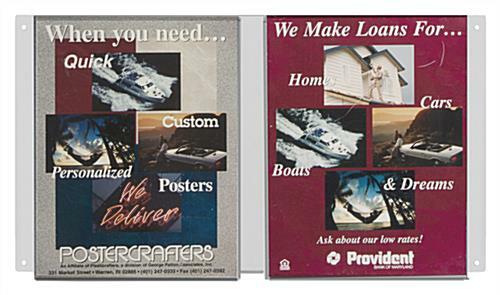 Cable sign holders advertise with (2) 8-1/2" x 11" prints side-by-side. These cable sign holders that are modular provide users with the flexibility of customizing a suspended signage display. These frames are specifically designed to be connected to other frames and hung from the ceiling. The cable sign holders that link together have (2) s-hooks for fixing the frames together, oppose to clips or clamps. A full set of ceiling mount hardware is not included with these poster holders. These storefront cable sign holders are ideal for promoting sales, specials and new products. Retailers in malls will use these acrylic frames in storefront windows. Grocery stores will hang the cable sign holders that are modular along aisles. Offices will post informational and directional signage in these poster holders as well. These cable sign holders for retailers have a modular design, making this line of ceiling-mounted frame customizable! 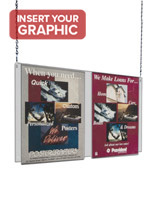 These poster hangers, cable sign holders are crafted from a single sheet of 1/8" thick acrylic. (2) 8-1/2" x 11" prints fit in this ceiling-suspended frame. These acrylic poster hangers exhibit prints in portrait orientation only. The fact that these hanging signage systems are frameless has several advantages for advertisers. First, the frameless acrylic construction of these poster hangers is inexpensive when contrasted with aluminum units. Second, this ceiling-suspended frame connects with s-hooks, instead of a more expensive sign fixing. Finally, this style of hanging poster holder mounts into the ceiling only. Not the ceiling and floor, like some more expensive signage suspension systems do. This acrylic frame is one of the most affordable means available for advertising in highly visible locations, such as a window.